BEIRUT: Running a few minutes late for a noon interview, Fouad al-Khazen strides into his elegant sixth floor Gemmayzeh office, speaking in French on his mobile phone. Khazen, who has amassed a fortune in the contracting and banking industries, cuts an elegant figure in a light grey Brioni suit and Rosetti shoes. Tall and slender, his silver hair is combed immaculately back over his forehead. "It's been a busy day," he explains as he slides his phone into his suit pocket. "I am flying to Saudi Arabia tonight - to pay my condolences." Khazen, relaxes in an upholstered chair under a print of a cat from the Metropolitan Museum of Art (one of his companies, Contracting & Trading Holding, goes by the acronym CAT). To Khazen's left is a sweeping view of the Mediterranean and downtown Beirut, which he, as a member of the board of directors at Solidere, helped build. On his left is a framed picture of him as a young man with Saudi Prince Majid, a son of King Abdullah. 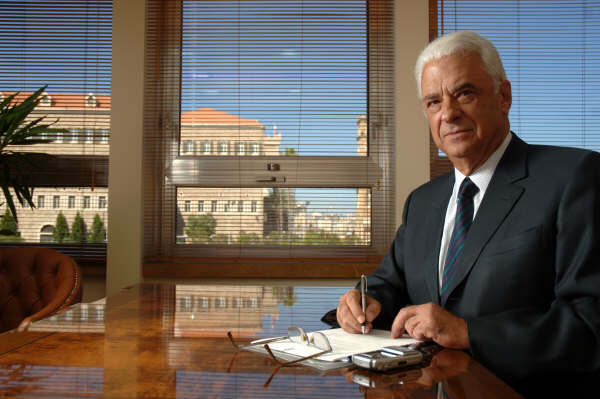 While he was a student at Ecole Superieure d'Ingenieurs de Beyrouth he married the daughter of Emile Bustani, the patriarch of a leading Beirut family and a former chairman of CAT. Khazen rose through the ranks of CAT, where he now serves as a member of the board of directors, and used his close ties with Gulf rulers to become one of Lebanon's most prominent businessmen. He controls an impressive list of companies and unions, including the Banque de l'Industrie et du Travail (BIT), Pan Arabian Travel Services, Mothercat Saudi Arabia. He heads the Lebanese Contractors Syndicate, and the Society of Hoteliers and Tourism. On the side, he runs the Automobile Touring Club of Lebanon, the Cooperation for Lebanese Development, and the Society of Lebanese Gastronomy. "I'm blessed with a team of very reliable assistants," he says, attempting to explain how he manages, at the age of 71, such a diverse collection of companies. "I don't complain about being too busy. There is a lot of variety in my life. I hate monotony." The last few months, however, have tested the ability of Khazen and his nearly half-century of experience in the Arab business world. The assassination of former Premier Rafik Hariri crippled tourism, strained the banking system, tested Hariri-founded Solidere and exacerbated an already difficult situation for the Lebanese contracting industry. While Solidere has engineered an impressive recovery - "A" shares are now at $13.56 after plunging to below $5 following Hariri's assassination - contracting has been hit hard by a general economic slowdown. Construction permits, for example, are down 15 percent in the first half of 2005 compared to the same period last year. The recent surge in oil prices has meant high construction costs, especially for asphalt. In addition, the Lebanese government closed quarries throughout the country due to environmental damages, meaning more expensive gravel and stone needs to be imported from Syria. Steel prices, meanwhile, have long been high due to increased demand from China. "We have been facing major problems, some due to internal factors, others due to international factors," Khazen says. As chairman of the Bustan Hotel and BIT Bank, one of Lebanon's smaller banks which is currently seeking to expand its capitol, Khazen has seen first hand the extent of the damage from the assassination, which has all but ruined the summer tourist season and made foreign investors nervous. "With oil prices high, there's a surplus of money in the Gulf, but they don't know where to invest it," Khazen says. "Lebanon would be an ideal place to put all the money because our banking system, with its secrecy and freedom of transfer, is attractive." "After September 11, Arab investors are looking for other places to invest," he adds. "Lebanon could have taken advantage of that but unfortunately we are passing through a very difficult and sad period." Like his father-in-law Emile Bustani, Khazen has made his career in part because of his closeness to the Gulf, where CAT made much of its fortune. On one of his office desks sits a book of pictures from his mountain home in Reyfoun. Visitors to the home include King Abdullah, who was chief of Saudi Arabia's national guard when he visited Reyfoun in the 1970's, the late U.A.E. President Sheikh Zayed, and a variety of other ministers from Gulf states. "They used to come a lot before the war," Khazen says of the Gulf royals. "I have hundreds of albums just like this one." Khazen has cultivated relationships with Gulf power-brokers for decades and knew most of the current rulers when they were young up-and-comers. His secret? Constant contact, whether through visits to Saudi Arabia or entertaining at his mountain villa in Lebanon. "There's a French proverb," he explains, smiling. "Far from the eyes, far from the heart." Who's in the family? Two children and six grandchildren. What car do you drive? "I drive many cars, but mostly a Mercedes 500 and an Audi A-8." What was your last vacation? "Two months ago, to southern Italy." "لو عدت من جديد لاستفدت من خبرتي وسلكت طريقي الماضية"
◄ يمكن وصفي بالرجل الاجتماعي. إنني أؤمن ب"العلاقات المخلصة", وهذه كلمة مهمة بالنسبة لي, وعلاقاتي متنوعة تدخل في نطاق مختلف الطبقات الاجتماعية, فهناك ,مثلاً, أشخاص يحصرون علاقتهم بنوعية معينة من الناس أو يتعاملون مع ثقافة معينة. إما أنا , فأشبه علاقاتي مع الناس بشخص يحب الموسيقى بجميع أنواعها, كما يستطيع الانسجام مع كل نوع, على حدة.